Posted in: Surf Reports. Tags: 165d-2.5m-7.6s, 2/10, S-2.5m-8s. Steady 20 kts of southerly and light rain greeted early risers today. Very unsummery. No one in the water at Dee Why at 0600 – which is hardly surprising given the details. 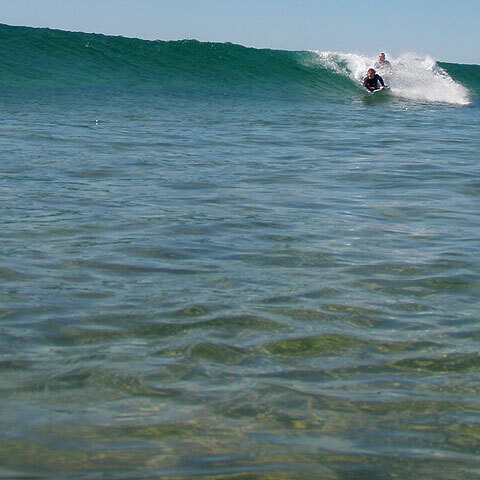 Swell is around 2.5 metres from the south with an average period of about 8 seconds. Visibility was too poor to take a picture when I first climbed aloft to see what was going on. It was surprisingly small at Dee Why though. Maybe waist high at the point and a touch bigger along the beach. But conditions are so ordinary that it’s all academic. The gloomy skies should clear in the afternoon says the Bureau, but the wind will still be hammering along from the south to SE. I’m not liking the look of the models this morning either. Basically, the predictions all seem to be pointing toward more blasting southerlies tomorrow and then easterlies on Wednesday. Yuck. If it’s southerly you at least have a chace of finding something in a corner, but easterlies really slam the door shut on Sydney. Good day to hammer into the obligations I’d say, so go well with it and stay happy! A high pressure system centred near New Zealand extends a weakening ridge to the far north coast of New South Wales. A southerly change on the north coast is expected to remain slow-moving and weaken on Monday. A high will develop near Tasmania early next week and extend a ridge along the coast. Northeasterly 0.5 metres tending southerly about 2 metres from midday. Southerly 20 to 25 knots increasing to 20 to 30 knots early in the morning then turning east to southeasterly 15 to 25 knots in the early afternoon. 2 metres increasing to 3 metres around dawn then decreasing to 1.5 metres during the afternoon. Isolated thunderstorms offshore from the late morning. Easterly 15 to 20 knots. Posted in: Dee Why. Tags: S-2.5m-8s. As the south change developed overnight, we got a little bump in swell energy and this morning saw chest high sets along the beach at Dee Why. After weeks of tiny conditions, the banks at the south end look to be pretty uniform and on the low tide they were shutting down hard more often than not. I expect it’ll be a widespread condition. Speaking of tides, there’s not variation today on that front. First of the low day is at 1045ish and the high comes along at 1630. There’s not even a metre difference between the two. As the tide turns the southerly should be decreasing a little. Outlook is for more southerly to SE conditions across the coming week. That should mean a steady supply of at least something wave like, but with the unavoidable imposition of onshore conditions at most spots. Early mornings look to be the best shot for the next couple days at least. A high pressure system lies over the eastern Bight, while a Low is developing over the central Tasman Sea, maintaining a southerly flow along the NSW coast. The high will move very slowly eastwards and weaken, forming a centre east of Tasmania on Wednesday. This high will then move slowly towards New Zealand, maintaining a ridge and east to northeasterly winds along the coast at the end of the week. Southerly 20 to 25 knots decreasing to 15 to 20 knots in the afternoon. 1 to 1.5 metres decreasing to below 1 metre around midday. Not the most inviting morning for a surf in Sydney. After a wild, windy and rainy night, it’s settled down a little. Rain continues, though not quite as heavily, and the wind is coming from the SE at 25-35 kts. The swell is dead south at about 2.5 metres on average, but the average period has slumped to 8 seconds. As a consequence, not much energy is getting into the protected corners. This morning’s forecast from the BoM brings now particular joy. We’re not likely to get away from the southerlies until midweek – when it looks like it might swing to SE winds. Blergh. Have yourself a good Sunday and may your team win tonight! A low pressure system will deepen off the north coast today and should move rapidly away to the northeast later. Behind this system, a high is expected to move towards Tasmania extending a ridge across southeast Australia, with another inland trough entering the far west of the state later in the week. South to southeasterly 25 to 30 knots. Southeasterly about 1 metre increasing to about 2 metres this afternoon and evening. Isolated thunderstorms this morning and afternoon. Large swells breaking dangerously close inshore. Southerly 20 to 30 knots decreasing to 20 to 25 knots around dawn. Up to 3 metres decreasing to 1.5 metres during the afternoon. Southerly 15 to 20 knots decreasing to 10 to 15 knots during the evening. Posted in: Big Picture, Dee Why. Tags: 6/10, S-2.5m-8s, WSW-15-20kts. Air temp about 10C, wind chill on wet skin, who knows. Not warm this morning, but there are waves. We have a couple metres of 8 sec period south swell working its way into the usual spots. The beachy is bigger than the point at Dee Why, with sets approaching the shoulder high range. Lots of folk were not being put off by the bitterly cold S-SW wind. It should be sunny all day, but the wind is due to swing more to the south, so conditions at some spots may go from okay to marginal. From the look of the swell data, we should have waves of some description all day. Tomorrow should see the conditions weaken into the marginal range, but then the models suggest that energy levels will perk up on Monday. In fact, the outlook for all next week is pretty reasonable – mainly fine conditions and waist to head high more or less. Peak days are currently forecast to be Weds and Thrs. Saturday until midnight: Wind: S/SW 20/30 knots, chiefly offshore, easing to 15/20 knots in the late morning and tending S/SE 10/15 knots in the afternoon.Sea: 2 to 3 metres abating 1 to 2 metres.Swell: S about 2 metres. Sunday: Wind: W/NW 10/15 knots tending N/NE 10/15 knots in the afternoon.Sea: to 1 metre. Swell: S about 2 metres, decreasing to 1 to 1.5 metres. Monday: Wind: W/NW 10/15 knots and afternoon NE seabreezes 10/15 knots. Posted in: Big Picture, Dee Why. Tags: S-2.5m-8s. Around 1100 there were a few little ones coming through at far south Narrabeen. 0820: a few sets and sunny skies to be had along the beach today. Typical. Long weekend ends and we have a bright sunny morning (bit chilly) and little waves coming in. 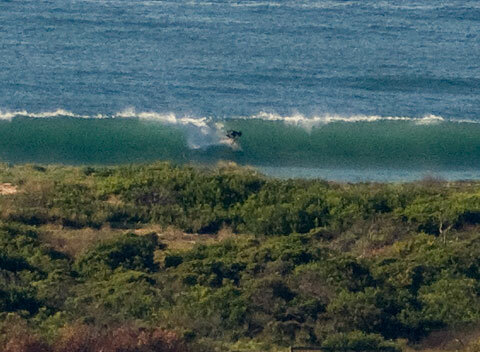 The swell basically started arriving around daybreak in Sydney. It’s out of the south and getting close to 3 metres on average. The power setting’s only around 8 seconds though, so the bigger sets are maybe shoulder high at Dee Why. Wind is out of the WSW at around 10-15 kts as I write this. The Bureau says it will ease off soon and be fairly light later this morning. By afternoon we can expect 8-13 kts of SE-NE wind. So, sounds like the plan is to get out there now I’d say. The forecast models are still showing a dip tomorrow and then another kick up on Thursday as an 8-16 hour wide long period south pulse rolls through. With luck it’ll peak during daylight hours. And the Bureau says Sydney can expect light and variable breezes in the morning before it turns around to the NE at 10-20 kts. Could be a case of North Corners are Go!